My scraps are becoming a problem. I have 12 clear shoe boxes filled with them, separated by color. But over the last year or so I've also accumulated baskets and bags full that I haven't had the energy to sort out. Honestly, they're taking over my sewing room. And I hate it. I'm sure if you hang out on flickr or read other quilt blogs, you've seen the awesome granny square quilts that are popping up everywhere. I love them! They use scraps! Perfect! I decided I'd go all out and make a twin sized quilt for Claire out of the blocks. So on Saturday morning I set about cutting 2.5" squares. I'm embarassed to say that I cut only eight before I thought I might go crazy. There are 25 of those squares required for each 9" block. Enter in the huge, scrappy, rainbow log cabin. I started with a big piece of Heather Ross blue ponies (one of Claire's favorites) and worked my way out with green, yellow, orange, red, and purple logs. I'll admit that I thought it was really ugly when I first started. The different shades of green clashed badly. But I kept going. And now I love it. The only thing I wish I had done differently would be to make the blue starting block more scrappy. It measures 68 by 88 inches, just right for a twin size bed. 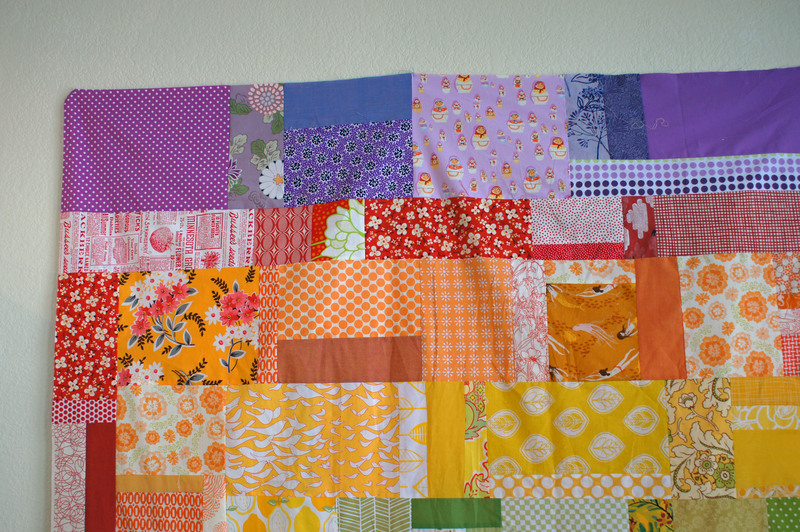 Of course this quilt top didn't solve my scrap problems. In fact, it may have made it worse. They're covering the sewing room! Whoops. Time to go do some clean up. http://www.inbetweenstitches.com/items/heartfire.aspx This is another great scrapbuster! It is beautiful in the French General on the cover - but it's awesome with moderns/brights, too! Oh, Claire is going to love sleeping under that quilt! One of the best scrap busting quilts I have seen! Sure to become a favorite. Looks great. I know what you mean about the scrap thing...it was getting to me today as well. It's only going to get worse....every project just creates more scraps. Help!! it's awesome! I can see how my girls would totally totally love a quilt like that. Plus it's so bright and cheery! 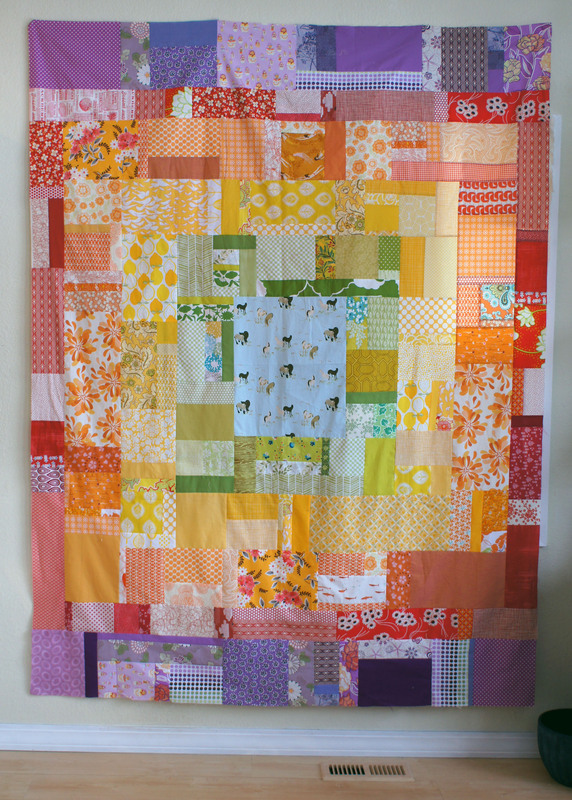 i really love this krista...you really worked your scraps...but i can only guess the scraps it created!! I think this is pretty awesome too Krista! That is super cool!!! Nice job! I absolutely love this quilt! LOVE!! Oh my word - it is beautiful! Breathtaking... truly. this is so pretty i love it!!! i have a soft spot for ROYGBIV anything!! You totally crack me up that you only cut a few squares before going crazy!! I love that you made this huge quilt in a weekend - wow!! 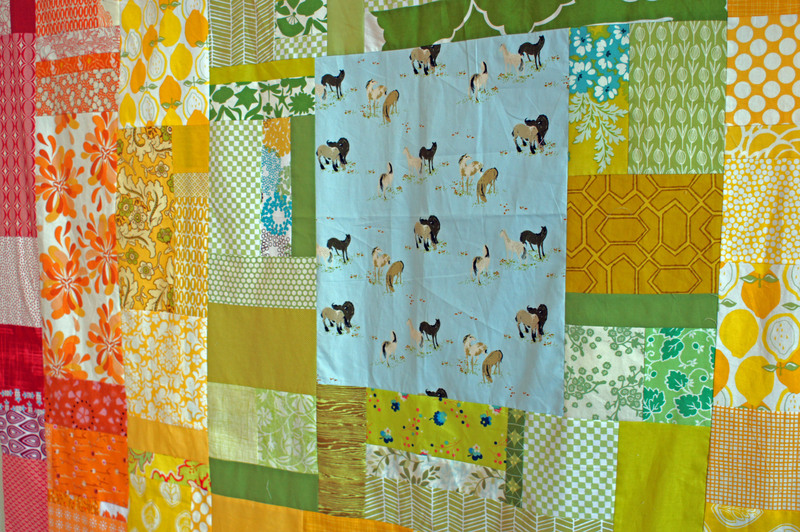 I just found your blog because of your quilt that was featured MQG blog...which I love! And now I am in love with your rainbow quilt! The first thing I thought when I saw that those granny squares require 2.5" squares was 'if I used 5" charms, those blocks could get really big really fast!' Not that I've gone past the thought stage. Thanks for including your story about the stalled granny square project =). Keeping it real! The quilt you ended up with is definitely a beauty.